S&P has stalled near former highs, but tough to call this pattern bearish. And 2920-5 remains a key area of upside resistance. Treasury yields continuing to press higher. With TNX now up to 3.08 and 2/10 curve up to 27 bps while Dollar shows evidence of stalling out. ENERGY working well.. and both XOP and OIH breaking out today. Markets weakening with S&P back down to key 2900 area and breadth fractionally negative heading into the last couple hours of trading. Technology and Financials both underperforming while Discretionary lagging more than any other sector with AMZN and NFLX both down more than 2%. Other retailers showing some signs of pulling back also with TIF, JWN, KSS, GPS and M all within the 10 top worst performing stocks in the S&P and lower by more than 1.6%. For now, unless S&P Futures finish under 2900, there’s insufficient weakness trend-wise to think markets start to accelerate lower, though the concentrated weakness in Tech is a definite concern along with the inability of Financials to muster much rally. Good progress out of CI this week- any pullbacks here should be bought. ZTS looks to be close to trying to bottom after the last month of sideways consolidation. NBIX would watch carefully as some evidence of topping behavior with 2 straight weeks of closing well off early week highs while extended. My CNBC interview from yesterday- Bearish on AAPL into Product launch given overbought conditions, targeting $205 for pullback as part of current intermed. Term uptrend. Both Technology and Financials negative.. so over 40% of the Market.. so while those sectors and Utilities are the only ones down.. 3 of 11.. they have a big impact on averages. Sectors like Consumer Staples, Telecom up more than 1% today. And Industrials also positive to the tune of 0.65%, so some good rallies in many names. Yet, Technology weakness looks to be taking a toll. Crude’s rally above $70 serving to help energy to some extent, but many Energy ETFs remain in downtrends and difficult to expect much of a rally. So gains have been tough to come by. Dollar weakness starting to extend a bit more in the last couple hours. While bond also rallying and Yields down to 2.96% on 10yr.. a bit of a pullback on last couple days. S&P- KEY RESISTANCE at 2895- near-term pattern will remain challenging until S&P can get above earlier highs. 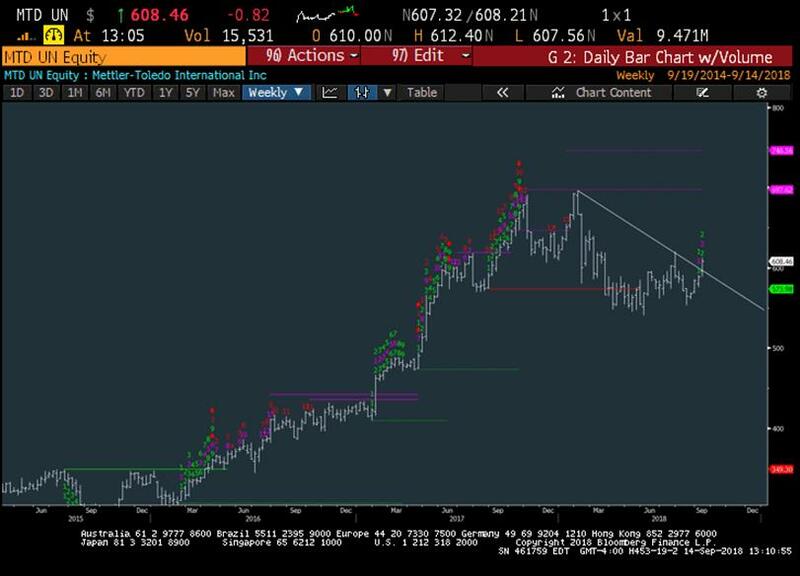 From late April to late August, AAPL rose about 26% in four months’ time, causing the stock to get very extended above its intermediate-term uptrend.. and weekly RSI to spike above 70 (Relative Strength index) and remains above 70 on monthly basis.. the most overbought since 2015. SPX - (3-5 Days)- Mildly bullish with stops and turning short again under 2865--It's thought that Tech stabilizing along with Industrials and Transports extending gains are minor bullish factors for the next couple days. Any reversal and pullback underFriday/Monday lows puts the bearish case back on the front burner for immediate pullback to 2800-7, but its thought that selling proves mild for now. SX5E- EuroSTOXX 50- Minor bounce possible but should NOT get above 3350, so 40 points maximum before this turns down again. Wave structure should result in additional weakness to take out lows in SX5E. Underperformance still likely. US Equities selling has been largely unconvincing lately, and despite some rotation out of Technology, we're still not seeing weakness in Industrials, nor in Financials, with Transports having extended after breaking back out to new high territory. While this splintered market might show a few days of rally attempts, largely driven by the Rails, it's unlikely that Tech can muster much strength, and this latter group remains one to avoid, outside of a few selective names within Enterprise Software. 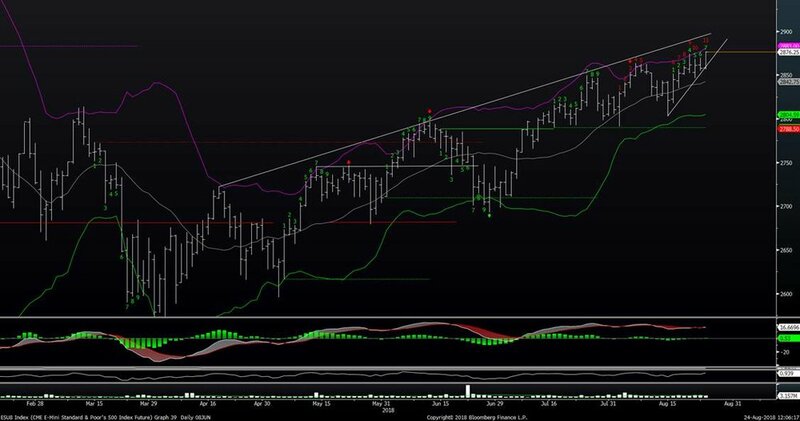 Technically one can make the case that Transports continue higher in the next few days given the recent breakout, and the pattern in XLI also looks more bullish than bearish near-term. While Demark weekly sells are now present on XLI, the larger pattern still merits sticking with it, from the long side, until more evidence of weakness appears. The Dollar along with Treasury yields and commodities have not shown much evidence of volatlity in the last 24-48 hours, so it's right to stick with what's working for the next couple days, that being Industrials and Transports, and stocks like KSU, CSX, URI, TXT, LII, ENS, AMR, ROP and EMR. XLI still looks to push higher in the days ahead after yesterday's outperformance. 240 minute charts showing four-hour bar charts for XLI look to extend to targets over 79 before any real exhaustion, which still looks premature on intra-day charts. Any test of highs from late January/early February would be an area to take profits, but might be difficult in September given the degree that momentum has turned down in other sectors. 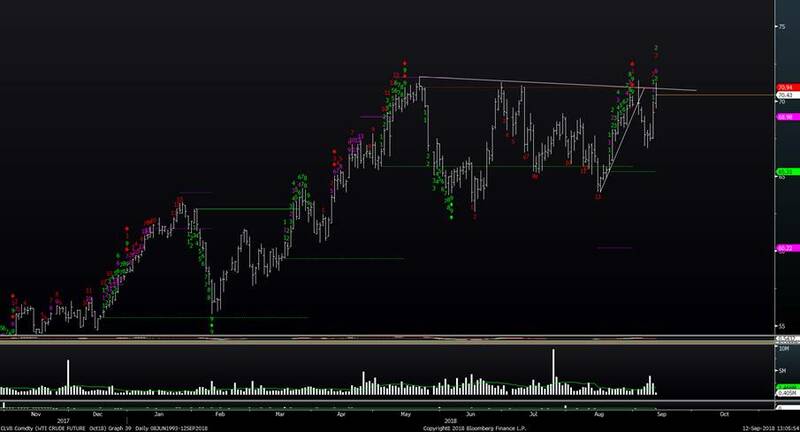 Transports look to be one of the stronger areas in the market in the short run, given rallies in the Rails and The DJ Transportation Avg has managed to extend its recent breakout to new highs and should be favored for further near-term outperformance in the days ahead. Overall, a move to 11700 looks likely before any real stalling out, and IYT could be bought technically for further gains near-term. AAPL looks to be finally showing some evidence of backing off, at exactly the same time we're seeing selling in other former leaders like FB, NFLX, AMZN and others. Many didn't expect that Equities would be able to hold up given a decline in many of the stocks that had carried this rally most of the way this year. For now, the rotation into Industrials and Financials looks important and has been able to hold indices up despite the decline in Technology. Near-term, this is a positive, but on any evidence of these other groups giving way, one would expect signs of markets showing further weakness in this seasonally tough month. AAPL looks to pullback to 205-210 into end of September, so any near-term rally likely will not mark any meaningful low near-term for AAPL, which pulled back to multi-day lows yesterday and shows little evidence of any exhaustion after its recent move. S&P- See that bounces failed to get back up above 2895 which was broken last week. While today’s move was a minor positive in having broken out above the “WHITE” downtrend, structurally trends are still bearish and momentum is negative. So it should be expected that rallies fail and lead lower, if not today, then over next couple days. VMC- VULCAN also violating quite a few past lows.. so for those looking for short ideas. This likely causes weakness in VMC in the days and weeks ahead. US indices remain weak, but have not really shown any real acceleration which has begun to happen in the rest of the world. Tuesday mid-day Technical Video- S&P, NASDAQ break initial support- Prices holding just under for now. Break of support.. but holding just under, for now. Bond yields and the US Dollar are higher, though yields have slipped from earlier highs. Healthcare, Materials, Telecom and REITS are all down more than 1%, and Tech is lower by 0.75% with only Utilities positive on the session. Overall, its thought that holding losses down under 2891 by the close would start the September pullback, but it’s a necessity to have the NASDAQ leading lower in my view. And this is happening today, with NASDAQ lower by nearly 0.90% and EEM also down more than 2%. A defensive stance makes sense under 2891, and its right to own/buy implied volatility. This is the real battleground for today. An important spot- so next 30-60 min will show whether this can hold or not. This is starting to stabilize and showing some evidence of bottoming. 3 more full days left in the month and as it stands this would be our best August in 4 years. Minor reversal thus far in S&P and DJIA, but nothing too meaningful. S&P needs to get under 2876 which is yesterday’s lows in Futures, and DJIA under 25826 to pay much attention. Overall given the extent of the rally over the last few days.. it’s likely that further gains are difficult to come by heading into one of the more seasonally difficult months of the year. Prices have gotten well overbought and many of the divergences between US and Europe remain while seasonality will continue to be negative through September, with Average mid-term election year losses of -1% for DJIA and -0.4% for S&P going back since 1950. The DJIA has still not joined the DJ Transports back at new highs, so there is some additional divergence there also which hasn’t been alleviated by the recent push of many indices back to new highs. VIX also has firmed of late.. and some positive divergence with VIX vs Equity markets.. as VIX remains up over 13% off early August lows and set to close at new 5-day high close today. For now, the trend remains bullish, but up against the UPPER channel of resistance since April and stretched, with RSI readings near 70 on Daily charts , the most overbought since January. Meanwhile, evidence of counter-trend exhaustion is now forming on Daily charts of many US Equity indices as well as style sectors. 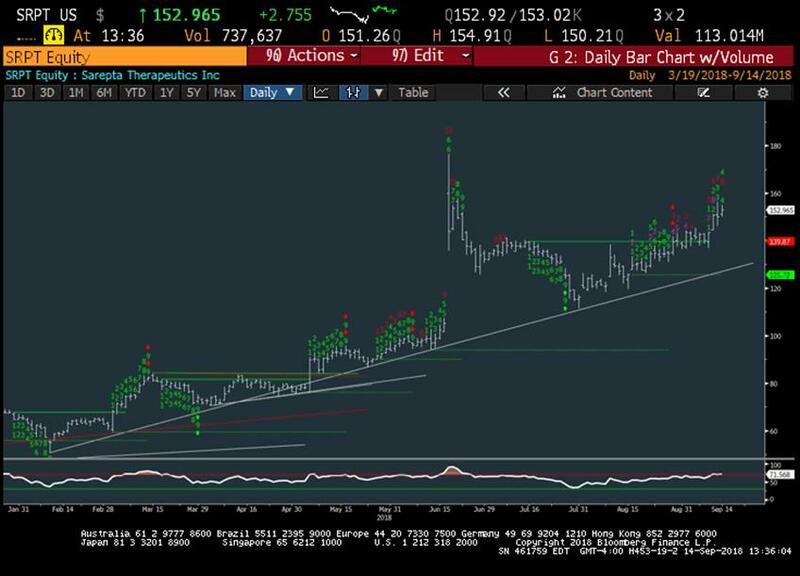 Technology’s minor breakout coinciding with NASDAQ moving back to new highs has helped Tech regain some of its recent underperformance.. While upside for XLK looks limited- ie 75.50-75.75- We’ll need to see Tech start to weaken before having much conviction that stocks move lower. Financials and Industrials both making breakouts in the ETF’s XLI, XLF- sector SPDRS.. While the issues we’ve discussed over negative breadth, poor momentum, and divergences to the rest of the world continue, for now these are on the back burner as no evidence of price weakness has occurred. Tech is up and NASDAQ attempting to breakout.. yet, Energy, Industrials, Financials, materials all down- Selectivity required. S&P FUTURES-HOURLY CHART_ Triangle of the last 24 hours led UP.. then down.. now back to unchanged. A very chaotic market to say the least. Minor pullback in the last hour after Cohen plea deal and S&P reversing from 2874, but in general. we’re seeing many indices move back to new highs today. Which is generally a positive for intermediate-term. – Small caps, mid-caps.. transports.. - SML, IWM, MID, TRAN back at new all-time highs The NASDAQ has lagged lately.. and below July highs- Near-term. While new highs have expanded.. they’re still at relatively low levels.. and McClellan’s Summation index is way below levels seen back in June. So the price action back at new highs doesn’t give a complete picture. But yet still important to note. RE: S&P- After 4 straight days of gains, and 70 points higher, Still no evidence of any reversal .. and prices have now reached 2874, which was the upside target when 2863 was taken out and now just 16 points under the all-time highs from late January. This has Gann SQUARE of 9 relationships to the 8/15 bottom and should have some type of importance today, but we’ll see- As charts of the S&P show below.. this area “should” have importance based on the relationships of former peaks.. but we’ll need to see some evidence of prices turning back lower to break this trend. Until that happens, it should be more important just to focus on what’s working and whats not. Breadth is 2/1 positive and the Defensives are being hit today.. while Energy and Discretionary are leading the charge. Technology is a relative underperformer, up 0.50% and the Dollar has begun to turn down more quickly- Yields have attempted to recoup yesterday’s drawdown- EEM outperforming again today and gains from both WTI and Gold are following through but movement up above 68.25 needed for bullish stance on WTI CRUDE while Gold (spot) will need to get above 1213 after all the failed rally attempts. S&P has continued to push higher post Europe’s close, but NASDAQ 100 remains negative for the day as Technology is down, and AAPL, AMZN, TSLA, Fb and TWTR are all lower. A breakdown in Yields would support the contrarian case of being long Treasuries given the massive negative sentiment, and this larger trend from Feb is showing increasing signs of giving way. Gold, silver rallying from very oversold state..
TNX down what’s thought to be an important area.. but no real evidence of this stalling out and turning back higher. 2.82 is important and under would allow for a quick test of July lows of 2.80%. Markets have risen above the last couple days highs, while bond yields have also risen and a minor bounce in both WTI and the Metals. So nearly opposite of what happened yesterday on all. Staples and Telecom are the best performing sectors, though all 11 sectors are positive which is the first time in the last couple weeks we’ve seen some broad-based strength. Being above 2843 keeps near term trend positive while any pullback back down under 2825 would put bearish scenario right back on the front burner. Unfortunately the last month has been largely range-bound with huge spikes in both directions, so a source of concern for both bulls and bears given the lack of any real trend. Energy being very hard hit. But noticeable that TECH is down 1.3%.. along with discretionary- 2 of the former leaders- IF NASDAQ 100 and COMP break 7158 and 7600 respectively. Than US market should experience a quick 4-5% loss into end of August. Note, EUROPE breaking down today with DAX, IBEX and Italy’s FTSEMIB on the brink. DJIA quite a bit weaker and has already violated early Aug lows- NASDAQ of course showing divergence in NOT making a new high over July.